Hello ... Hello ... my old friends ... It's great to see you once again! Believe it or not, this is my first full review of a gig headlined by The Move with ELO Beatles Forever [ELOBF] having previously covered their live performances with The Animals , as part of Bev Bevan's Walk Of Stars celebration , the Brewood Music Festival  as well as Trevor Burton's Walk Of Stars event and his Third Charity Show . So, the thirty  mile journey from Wolverhampton to see the 2014 incarnation of The Move in concert last night [Friday 28th March] at The Marr's Bar in Worcester - in the company of John Collins [from the excellent Forever web site] and ELOBF gig buddy Christian Evans - was very much a high priority. But first, mention must be made of the support act for the night: Mods & Sods. 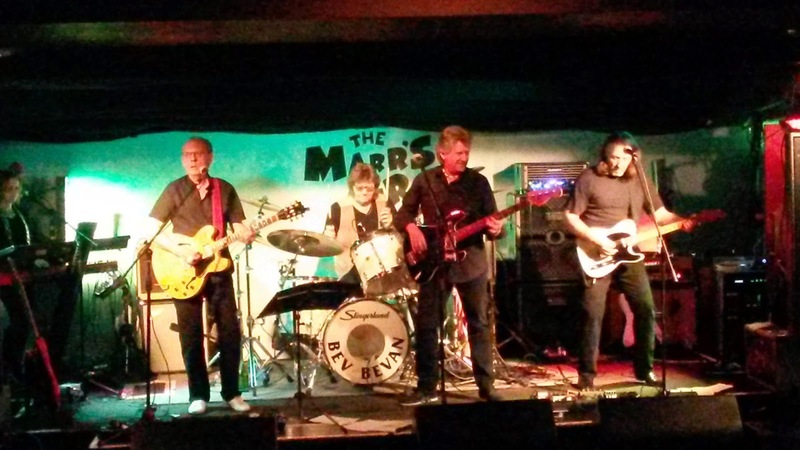 I've now seen this band on a couple of occasions and on both occasions they have impressed with their accurate and entertaining covers of classic tracks by the likes of The Who, The Small Faces, The Beatles, The Kinks and The Jam. Indeed, in many respects, they were the perfect foil to The Move as they reproduced the soundtrack of the bands who were contemporaries to the band who would bring forth ELO in due time, with a strong set list including: "You Really Got Me"; "The Seeker"; "Jumpin’ Jack Flash"; "I Can’t Explain"; "All Day And All Of The Night"; "Substitute"; "Watch Your Step"; "All Or Nothing"; "What’cha Gonna Do About It? "; "I Feel Fine"; "Gimme Some Loving" and: "Louie Louie". And what of The Move? For me, this was their most impressive and expansive set for not a few reasons. Firstly, the inspired addition of Abby Brant to the line-up to provide her distinctive keyboard attributes and to enhance the bands vocals harmonies was a master stroke. Secondly, the benefits of an ongoing multi-date tour and doubtless the pre-tour rehearsals have meant that the band are many degrees tighter and expressive, mirroring the reputation of the original band. Thirdly - and maybe most importantly for this writer - the band endeavoured to deliver not only a parade of their many hits and a taste of those iconic Marquee nights, they also included half a dozen songs not heard live for decades. I was thrilled to hear the likes of Roy Wood penned classics "Night Of Fear"; "Hello Suzie"; "Wild Tiger Woman" and [of course] the Jeff Lynne penned "Do Ya" played live by The Move for the very first time. Add to that the interspersed recalling of life on the road in the States, the Carl 'Charlie' Wayne inspired reformation of the band and other Move memories by Trevor and Bev, and you had much more than your money's worth. It was also good to see an increase in the prominence of Tony Kelsey and the icing on the cake must have been the inclusion in the set of Trevor Burton Band favourites "Wild Thing" with [naturally] the Trevor Burton rendition of the Hendrix' seminal swansong "Hey Joe" stealing the show. All in all, it was the best live performance by The Move that I've had the pleasure to experience. The Move performed: "I Can Hear The Grass Grow"; "Fire Brigade"; "Something Else"; "Hey Grandma"; "Flowers In The Rain"; "Night Of Fear"; "Sunshine Help Me"; "Hello Suzie"; "Goin’ Back"; "Wild Tiger Woman"; "Brontosaurus"; "Mercury Blues"; "Do Ya"; "Wild Thing"; "Hey Joe"; "California Man"; "Blackberry Way"
ELO Beatles Forever [ELOBF] recommends The Move featuring Bev Bevan & Trevor Burton to those enlightened folks who enjoy the music of ELO, Jeff Lynne, Roy Wood, The Idle Race, 'Brum Beat', The Beatles and related artistes.